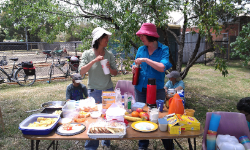 Moreland Community Gardening: Big Dig Day #1: Wow what a day! Big Dig Day #1: Wow what a day! Panoramic garden making, who'd of thought? I hope those of you who came along last weekend are pleased with yourselves. I reckon you're amazing! Most of our granitic paths are now laid and the west side communal garden bed was turned over, enriched, planted, mulched and watered. We even signed up a watering detail to keep the seedlings alive and had a good feed (again!). A few tough souls braved the heat on Saturday to give us a great head start, getting lots of the path work done and then on Sunday around 30 of you turned up and worked non-stop from 10am until past 4pm. Thanks to all your hard work and patience we've planted some food in our community garden. It's pretty exciting stuff really. If you didn't come along, make sure you keep the 4th Sunday of each month clear so you can get along and do your bit. We also started to take applications for personal plots. I'll post separately on this in the next few days with information about how you can apply. If you took photos or video, we'd love copies for our a record of the day and what we achieved. Please email them to grow.eat.moreland@gmail.com or if they're too big, send an email and we'll work something out.